The ultimate guide to Chatel ski holidays in 2019 & 2020. Up on the Franco-Swiss border in the Chablais region (a UNESCO Global Geopark), Châtel’s a pretty mountain village with excellent links to the Portes du Soleil resorts of Avoriaz in France and Morgins and Torgon in Switzerland. Châtel’s architecture is gloriously traditional, built using local resources in classic chalet style with huts and houses dotted on the hillside. Though ski tourism has picked up over the last seventy years or so, it feels as much of a farming village as a ski hub - a lot of Châtellans continue to work in agriculture like generations did before them. The skiing is split between two sectors – the first is Super-Châtel Barbossine, which links over to Morgins and Torgon in Switzerland via the Super-Châtel and Petit Châtel/Barboussine lifts. The second, Linga Pre-la-Joux, stays on French terrain, taking you over towards Avoriaz via the Du Linga Telecabine from the Villapeyron / Quartier du Linga area. 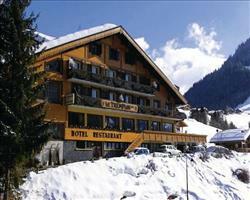 All are covered by the Espace Liberte pass, which covers a total of 130km of pistes. It’s also possible to upgrade to the Portes du Soleil pass, for access to Morzine, Les Gets and a number of other resorts. Geneva airport is an hour and a quarter’s drive and Thonon is the closest rail station, just under an hour away. View our detailed Chatel snow forecast or snow report and see all live webcams, piste maps, road and travel maps and lift pass prices. For a picture of historic snow conditions see the snow depths month by month with our Chatel snow history. The Super-Châtel telecabine transports skiers and boarders from the village to beginner’s and kid’s areas, which have links to a number of green, blue and red slopes. For a spot of Swiss skiing, intermediates can use lifts and red runs to connect to Morgins or explore Torgon via the Petit Châtel and Barboussine lifts. On the Linga side, we like blue graded La Leiche which leads through the forest back to the village. 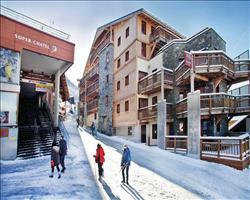 For red run skiers, Le Linga is a fabulous valley descent from Tete du Linga at 2156m. Experts will find the biggest variety of challenging terrain around Linga and Pré-la-Joux. There’s also the black Barbossine run – a seriously steep and bumpy ride down to the chairlift. If you’re heading off piste, the DVA Park run avalanche safety courses. Exciting additions to the area include a fun zone where you can record your speed and the Smoothpark, with its rails, kickers, boxes and a boardercross for every level of freestyler. It might not have the party reputation of Val d’Isere, but there are some brilliant bars in Châtel when it strikes après ski o’clock. L’Avalanche on Route du Linga is a cracking bar with live music and DJ’s playing until late and Nazca has a sun terrace for when the weather’s good, with drinks, dancing and themed nights. You can’t stay in the region without trying Abondance cheese - whether it’s part of a raclette, vacherin or fondue, it makes for the ultimate post ski feast. Creperie Bretonne La Galettiere create some of the best pancakes in the Portes du Soleil, with dozens of different varieties. La Poya does traditional French food with a twist (try one of the set menus), while Hors Piste is good for pizzas and burgers. There’s no shortage of activities here, from the ice rink by Lake Vonnes (its tea room serves amazing waffles!) to airboarding and yoonering on the Pierre-Longue chairlift slope. The Forme d’O Centre aquatique has pools, spa facilities and more and you can learn local history in the old Customs House. When is the best time to ski Chatel? 40% of the local area has snowmaking if Mother Nature ever needs a helping hand. The highest pistes can be found at 2200m, with the nearby French resort of Avoriaz holding onto the white stuff the longest. Santa’s little helpers are usually on hand over the build up to Christmas in Châtel, running workshops and performing in shows before the arrival of the man himself on Christmas Eve and Christmas Day. New Years in Châtel is traditionally celebrated with fireworks, live music and a DJ (there’s been free mulled wine and hot chocolate on previous years too!). The brilliant family facilities here make for a cracking Half Term in Châtel, and it’s likely to be less busy than the bigger Portes du Soleil resorts. We love Châtel for families, from the easy slopes up in Super-Châtel to the likes of air boarding and ice skating for post-ski fun. The events over Christmas and New Year cater brilliantly for children – ask us to help you find the best accommodation for your clan for an amazing week all round. Groups of all shapes and sizes will love Châtel and the Portes du Soleil – learners can stick to the local pistes while more experienced skiers and snowboarders head over the border to Switzerland and explore the wider ski area.